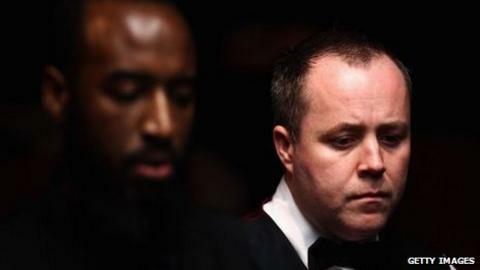 Defending champion John Higgins survived a scare to edge through to the UK Championship last 16 with a 6-5 victory over Rory McLeod in York. Higgins, 36, who has been critical of the event's new shorter format, looked rusty as he fell 4-2 behind. But the three-time champion fought back to lead 5-4 and although McLeod forced a decider, the Scot kept his nerve. Two-time champion Ding Junhui also survived a scare, fighting back from 2-0 down to beat Mark Davis 6-5. Higgins, who won an epic final against Mark Williams 12 months ago, will face fellow Scot Stephen Maguire in the second round after Maguire beat Stephen Hendry 6-3, while Ding will face Matthew Stevens after the Welshman beat Marcus Campbell 6-2. Former world champion Graeme Dott defeated Matthew Selt 6-1 while Neil Robertson was in equally impressive form with a 6-1 win over Tom Ford in the day's other matches. World Snooker chairman Barry Hearn has introduced a new format for the tournament's return to York which sees matches reduced from best of 17 frames to best of 11 until the semi-finals. Higgins has been openly critical of the move and admitted to first-round nerves before his match with McLeod, but he started his defence encouragingly with a fluent break of 80 to take the opening frame - but only after McLeod had miscued and sent the white flying off the table. The lead changed hands as both players struggled for fluency and McLeod won the 10th frame to move to set up the decider. But the Scot, who is so often at his strongest when his back is against the wall, fluked two balls, including a yellow as he tried to escape a snooker, to ensure he progressed to the last 16. "I had two nice flukes and I needed them - I was lucky," said Higgins. "Rory played ever so well, probably the best he's played on TV. I know he made three centuries in a row against Ronnie (O`Sullivan) in this event a few years ago, but in terms of his all-round game that must be his best display. Higgins revealed that his preparation has been affected by a bad back. "It happens every now and then, always in the same place in my lower spine," he said. "I've been driving up and down the motorway over the past week, to do a promotional day here and to the PTC event in Sheffield, so that's not great for the back. "It would have been a bad end to the year to lose today so I'm delighted to win and I feel OK about my game." Ding, who won the UK title in 2005 and 2009, also struggled to get out of the blocks, trailing 2-0 to Davis who looked the more comfortable of the pair. The Chinese levelled the match though as mistakes started creeping into Davis's game. The pair then traded frames until Ding forced a decider and then fluked the final pink to progress to the second round.